With 4 games to go, the Dallas Cowboys defense has accounted for a total of 26 sacks through 12 games. The season doesn’t end today, but if it did, they would fall short of all Cowboys annual sack totals going back a decade (32 was the previous low set in 2003). 26 is a very low number for a team total, and a real far cry from the amazing 59 that the Cowboys put together in 2008 when they had DeMarcus Ware, Jay (Jeremiah) Ratliff, and Greg Ellis all crashing the pocket together, with Chris Canty and even Bradie James (8 sacks!) pitching in. They are 26th ranked in the NFL with 26 sacks, above several bad teams and the Chicago Bears with fewer sacks (a team that needed Jeremiah Ratliff) below them. The odd part about the very small sack number that the Cowboys have accumulated would be that they had 13 sacks in their first 3 weeks, and then 13 more sacks in the next 9. Yikes. Jason Hatcher has an amazing 9 sacks, George Selvie 6, and DeMarcus Ware just 5 in a season where he has hoped to find his health and never seemed able to do so. Without an amazing December, Ware will fall short of the 10 sack mark for the first time since his rookie year of 2005. And that will no doubt cause a small amount of drama knowing that he is sitting on cap hits of $16m and 17.5m in the next two seasons, but only is a $8m cap hit if they said goodbye. Nobody wants them to say goodbye, but there aren’t many places in the roster where you can shave off $8m in cap space with one decision and while Ware has been a star for almost a decade, we know that Father Time always wins. My guess is that he restructures his deal down considerably (to $10m or so) so that they are not paying him QB money, but I suppose he can disagree with that opinion and we can see what Jerry would do next. Try as they might, this front 4 has not made anyone forget the front 4 that made the Tampa 2 famous with their ability to destroy the offensive backfield so many Sundays, but like that group, the Cowboys are generally reluctant to blitz. 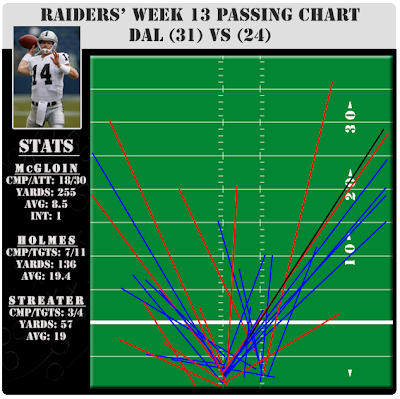 Our charts below track this each week, but just know they brought pressure in 11 situations on Thanksgiving against Matt McGloin and that tied their season high for blitzes. 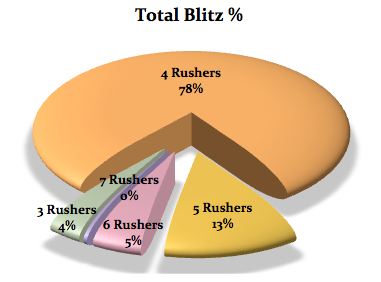 They want big numbers in coverage rather than risking giant passes behind them. 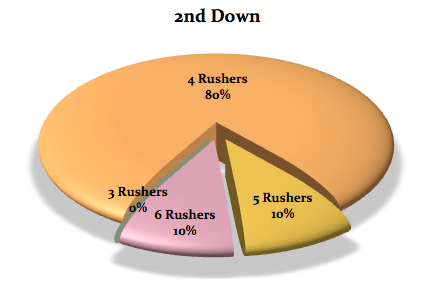 It many respects it is picking your poison and given that they are 32nd in Opponents yards per game, 31st in Opponents yard per play, 32nd in Explosives allowed in the last 8 games, 32nd in 3 and Outs, and 32nd in 1st Downs allowed, you can see that the poison has been administered to this defense quite a bit. And yet, because of 7 different games this year where the Cowboys had multiple takeaways, the team is 7-5 going into December. Now, they actually lost 2 of those games (Denver and Detroit), but when you are turning the ball over and giving the team a very short field or scoring touchdowns yourself, you remain in the hunt regardless of yardage allowed. 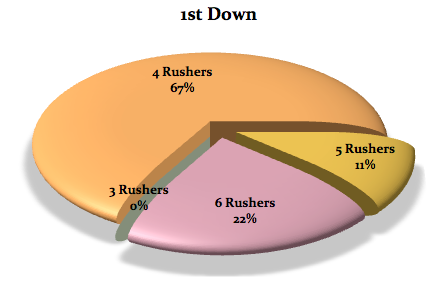 Touchdowns this season from Nick Hayden, Barry Church, Brandon Carr, Jeff Heath, and Sean Lee, as well as turnovers that start the offense inside the 5 on a few occasions – including the one that got things rolling on Thanksgiving Day are doing most of the heavy lifting and righting plenty of wrongs. Here is the record over the last 6 seasons for how important the turnover battle remains – so much so that they are able to overcome a number of other obvious weaknesses and still win games. They are 5-2 in games with the turnover advantage this season and 0-1 in games where they were a minus (at Kansas City). To play 12 games and to only lose the turnover battle once speaks to the ability for this team to play a smart brand of football. And that is a tandem deal. Taking the ball away is fine, but if your offense is returning the favor, it gets you nowhere fast. The Cowboys have done a supreme job this year – to this point – of being #1 in the NFC in fewest Giveaways and #3 in the NFC in most Takeaways. That type of differential is almost impossible to screw up. If they maintain a +12 margin, there is almost no way to miss the playoffs according to history. As you can see, almost all seasons of positive turnover margins ended in the playoffs, and almost all negatives did not. There are a few that fly in the face of that logic, but overall it stands out. And, to be a +12 in the year after a -13 speaks to this team understanding the value of the football and being smart with it – and taking it away. It takes both sides of the ball working in concert to pull this off, and it seems like they may fully grasp it in 2013. Perhaps another sign they are more well-coached than we think. Another great effort by Jason Hatcher and George Selvie. Good to see Selvie showing that he isn’t completely gassed as his workload is unlike anything he has every experienced. His play has fallen off a bit, but given that he was never supposed to approach the 587 snaps he has played, he still needs credit for a lot of where this team is on defense. That would also apply to Jeff Heath who has been far from ideal, but is fighting his tail off each week. Wow. A team that gives up explosives should not surprise us when they give up explosives (plays of 20 yards or more), but 7 to the Raiders? All through the air???? Crazy. 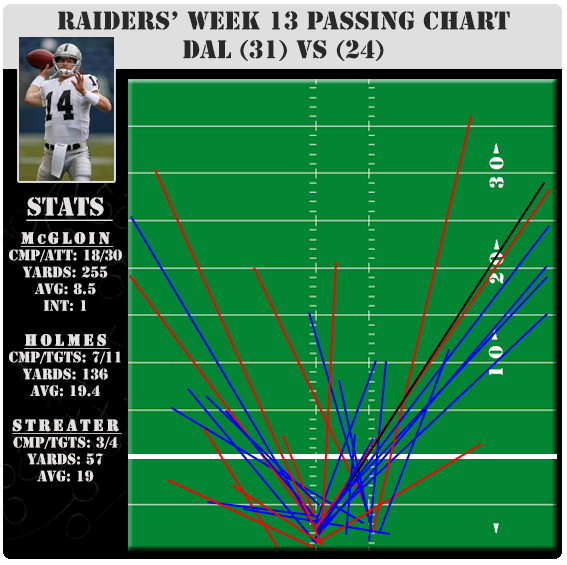 Matt McGloin certainly accomplished more than we expected, but the Cowboys allowed him to play against a single-high safety most of the day and took away his running game. That had mixed results early, but proved to be a sound strategy over 60 minutes. Here is what he accomplished on the outside boundaries with all of those blue lines, but the black line was the interception late that doomed Oakland. SUMMARY: They have the ability to make plays on the ball and cover a lot of warts. And make no mistake, as we detailed above, there are a lot of warts. The hope is that Sean Lee comes back and makes sense out of a lot of what has gone wrong since his departure with the Cowboys being steamrolled on the ground by the Saints and Giants. The fact is that this has not been a great defensive year, but it is also clear that they have not had DeMarcus Ware and Sean Lee healthy at the same time since Week 5. Perhaps, if they can both stay not the field in December and return to their normal form, this team can get to its 10 wins and feel great about themselves as they return to the playoffs. Of course, a lot can happen between now and then, and almost nothing is assured at 7-5, except that remain in the hunt. As it stands, the Cowboys have significant personnel issues that remain. I hesitate to allow injuries to claim too much of the blame because we knew last spring that safety and defensive line issues need immediate attention. Yes, injuries made it worse, but in April, I will pound the table again for defensive line and safety attention in the personnel department. I like JJ Wilcox as a prospect and Jeff Heath as a special teams contributor/depth guy, but what could an elite safety do to this entire operation? 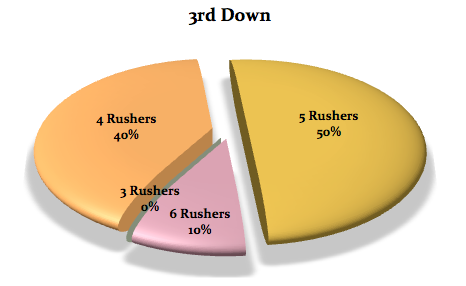 Some people argue that Seattle runs this exact scheme, but let’s not forget what elite safety play (Earl Thomas in center field) can do to a scheme. Its not always the Xs and Os, a wise football man once said, but the Jimmies and Joes. The football gods might be smiling with backup QBs a possibility against the Bears and Packers, and then a Redskins team playing out the string season in Game 15, but the Cowboys defense needs to stay on target. Get some injury luck and finish December strong after a small break would be the hopes. If they can do that and generate a few more short fields, a division title might be in the cards.